Sussex Forklift Training offers two different types of qualifications. The first we call an in-house certificate of training. These are qualifications that have been designed 'in-house,' independent of an Awarding Organisation, and are not regulated by a UK Regulator. The certificate given to successful learners will only contain the Sussex Forklift Training logo. Learners should not confuse an 'in-house certificate' with a 'Regulated Qualification'. A 'Regulated Qualification' is a certificate that is provided through an Awarding Organisation recognised and regulated by one of the UK Regulators (e.g. Ofqual in England or SQA Accreditation in Scotland). Sussex Forklift Training are accredited by Pro Trainings who are an awarding organisation who monitor and audit us throughout the year. They provide us with the most up to date information regarding changes to legislation and training materials. This accredited qualification will contain the logo of Pro Trainings (TQUK), and the relevant UK Regulator along with the trainees registration number. Be aware that if your company have multiple sites, each site should have the minimum requirements as determined by the risk assessment and number of staff. ACOP 3(1) "An employer shall provide, or ensure that there are provided, such equipment and facilities as are adequate and appropriate in the circumstances for enabling first aid to be rendered to his employees if they are injured or become ill at work. ACOP 3(4) " An employer should make an assessment of first aid needs appropriate to the circumstances (hazards and risks) of each workplace. ACOP 3(52) "Where the first aid assessment identifies a need for people to be available for rendering first aid, the employer should ensure that they are provided in sufficent numbers and at appropriate locations to enable first aid to be administered without delay should the occassion arise. Where 25 or more people are employed, even in low-hazard environments, at least one such person should be provided. This course is designed for people who want to receive our most thorough first aid training. The course is suitable for all businesses, particularly those with large numbers of personnel which work in any environment from low to high risk, ensuring shift work/out of hours have provisions at all times. Please note if a business has more than one location each site must be assessed per category of risk and per number of personnel. Certification Successful candidates receive a certificate, valid for three years. 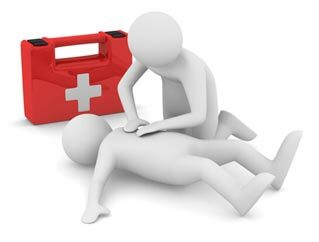 This course is for people holding a current First aid at work certificate. The course is suitable for all businesses, particularly those with large numbers of personnel which work in any environment from low to high risk, ensuring shift work/out of hours have provisions at all times. Please note if a business has more than one location each site must be assessed per category of risk and per number of personnel. This course covers the contents of the three-day First aid at work course in 2 days. Students will requalify for the three-day course. Please contact us if you need any guidance. Successful candidates receive a certificate, valid for three years.